Simple Cake Decorating – Create, Make & Bake! If you are short on time or, like me, make a complete hash of trying to decorate a cake with writing or icing then there is a simple solution. 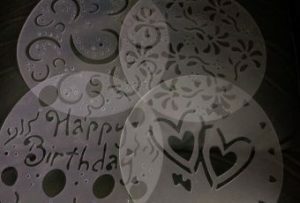 Cake stencils! These can be bought very cheaply online but can make a cake or dessert look more special in seconds. And below are a couple of things we have already decorated with them. 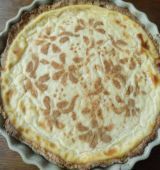 Milk Tart, the pattern is made with cinnamon. A sandwich cake, icing sugar was used to make this.